Gum disease is the inflammation of the gums and is known as gingivitis. If gum disease is not treated it can develop into periodontal disease, which can weaken the bones supporting the teeth. The main cause of gum disease is plaque, which contains bacteria and builds up on the teeth, if not removed. If you are suffering from any of the above symptoms, we would suggest that you attend your dentist and express your concerns. In the Dental Team, I come across many cases in which a patient has been attending their dentist for a number of years and they have reported bleeding or sore gums, but have been reassured that this is normal. If you do have concerns, then I would suggest seeking a second opinion from a different dentist at your practice or from a dentist at a different practice. 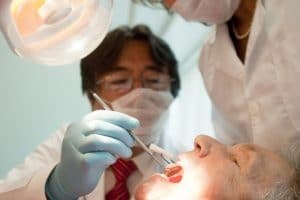 What can I do if I have gum disease? If you suffer from gum disease, unfortunately there is no cure for the disease and the condition can only be stabilised with treatment. If your condition is mild, then you can usually stabilise the disease by improving your oral hygiene, which can include brushing your teeth at least twice a day and using interdental brushes to get to the difficult areas of your mouth. However, you may require a referral to a hygienist if the condition is more severe. This may involve a thorough clean of your teeth to remove any hardened plaque, which is known as tartar. In some cases you may require root planning (debridement) which is a deep clean under the gums to remove bacteria from the roots of your teeth. This treatment can be uncomfortable and you may require local anaesthetic before undergoing the treatment. If your gum disease is very severe, then you may require periodontal surgery. The cost of attending the hygienist and undergoing treatment can be very costly and would not be available on the NHS. What could happen to my teeth? Unfortunately, if treatment is not sought in a timely manner you could be at risk of losing several teeth. I have acted for patients who feel very self-conscious when they have lost teeth. This can also have an impact on their social life, as they are unable to eat certain foods and may not be able to go out for a meal with friends and family. Further, the cost of replacing teeth is expensive, particularly if you require dental implants. In order to prevent these problems, then it is important that you attend regular check-ups with your dentist. When attending your dentist, they will carry out checks to monitor your periodontal health. You can also take measures to ensure that you practice good oral hygiene techniques and maintain a healthy diet. If you consider that your gum disease has been mismanaged or has gone undiagnosed, then please do contact us to discuss this further.